I took this photo when I was in Rio in my son's apartment 5 or 6 years ago. My son turned out blurry as he was jumping around. However, the Face in the mirror is very vivid. I took a series of photos of my son, about 6 or 7, but this is the only one containing the Face. I wanted to share as well as to hear other people's opinions. Hello and welcome to the forum. It is an interesting image that is for sure. 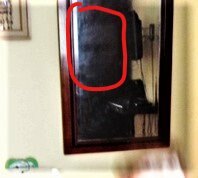 If you look at the reflection of the dresser, sort of through it...you will see a giant face about the size of 1/3 of the dresser itself. It looks a bit like the anime character Deathnote. It also looks like a dusty reflection of the wardrobe/cabinet. I see Michael Myers...dont ask me why!! It looks like smudges or dust on the mirror to me. I see how it’s shaped like a face, but I think it’s jus an illusion of the light. Hello and welcome, I see what you're referring to and it does look very creepy! The mirror is reflecting the shelf, tv and the side of the cabinet. Could there be a poster or artwork on the side of the cabinet? Looks like a bearded man.